The call for sacrifice and to do one’s duty bravely which this appalling War has given has been nobly responded to. Throughout the whole country wives have given their husbands and parent’s their sons, to serve their King and Nation. This district has not been behindhand in the matter. Many of our best have gone and with them go our good wishes and prayers. Daily in Church we pray for them and on Sunday at the chief service of the day we mention them by name before the Throne of Grace. Those whose names I have not yet received I should be most happy to have, as I do not wish to omit any. There are other ways too beside the one already mentioned in which we can respond to this call. Take for example, the prevention, if possible, but if impossible, the relief of distress. The well to do and those with only a little margin to spare have vied with each other over this. On the one hand the Squire of Hawarden on our pleading for help before the Executive Committee of the County Relief Fund at once guaranteed a sum of money to meet our immediate needs; and on the other, one who is not entirely unknown to you, brought to me his life’s savings to be used as I thought best. Also we are most grateful to Messrs. Summers for the provision of a certain amount of labour for a good proportion of their men. This has relieved a great amount of distress and I can assure them that the men appreciate their action very much. So also do the wives and children of the men who are with the colours for their generous weekly allowance. Our people too have risen to the occassion and deserve every praise for the way in which they are trying to relieve acute distress. The Church collection for the Prince of Wales’ Relief Fund was an excellent one and already the house to house collection has brought a large sum. Frequently I am asked “are we going to keep the harvest Festival this year?” and invariably I answer “most certainly.” War ought not to make any difference to our thanksgiving, except that it much more real and intense. Fortunately for us as a nation the harvest is more plentiful, and whether the war has ended or not by the time we hold our Festival, Thursday, September the 24th, everyone should come before God with a most grateful heart to praise and thank Him for His gifts. The Dean of St. Asaph has very kindly promised to come and preach our Harvest Sermon. J.J.J.R. 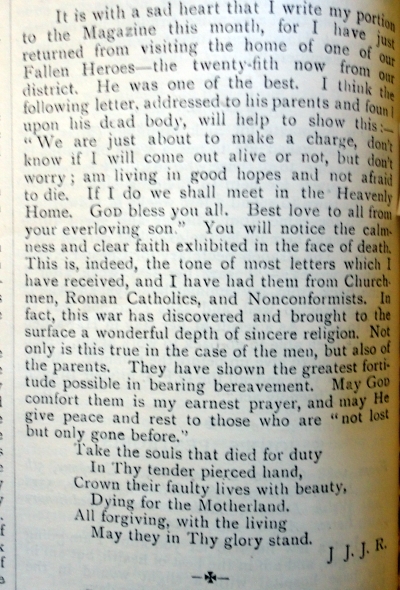 The Rector made allusion to the number of Church lads, in this parish who have joined the King’s Forces. It is our proud boast that the number of our old scholars who have responded to their country’s call is not surpassed, and not likely to be equaled by any school in this county. We are anxious to have to names of all old scholars who are or will be serving, as a permanent memorial of our old boy’s patriotism. T.H.H. ……”I have one other thing to say. In the local weekly paper I see a letter from “Workman” asking that a monument might be erected at the entrance to St. Ethelwold’s Church in Memory of the Fallen of the War; and he adds ” Will someone move in the matter?” May I say I have already done so and have been collecting particulars with a view to erecting a suitable memorialat the close of the War. Therefore it would be of great assistance to me if relatives of our “fallen heroes” would inform me so that I might add the names etc. to my list. Then in time a committee could be formed and public subscriptions invited. J.J.J.R. 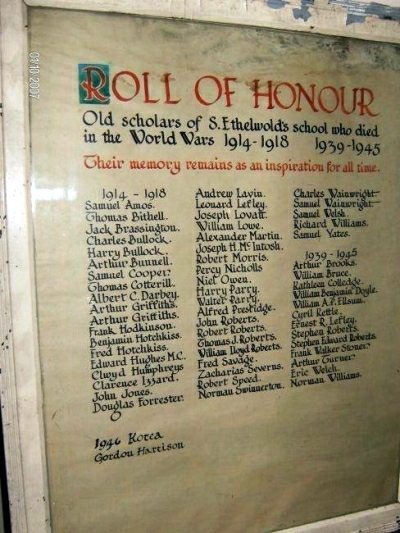 The question of establishing a permanent memorial to local men fallen in the war is to the fore in connection with St. Ethelwold’s Church, Shotton. Mr. Robinson (the Vicar) first thought was a “Calvary” placed in the churchyard; others suggested a plain cross there. But now the inclination is towards something more serviceable. The following are mentioned:- 1, a screen in the chancel arch; 2, a war memorial chapel; 3, church bells. The first, it is estimated, would cost £200; the second, £100. The bells would require an expenditure of £2500. The third proposal is stated to be the most popular, and the relatives of the men who died for their country (who are nearly a hundred) all desire the bells, except in two cases, where a arch is preferred. A general meeting will be summoned, and representatives invited from all local institutions to discuss the proposals. Shotton – St. Ethelwold’s War Memorial – The Deeside & Buckley Leader 3rd October 1924. Arthur BUNNELL, Samuel WELSH, Charles WILLIAMS, Robert SPEED, Benjamin DUTTON, Randall MORRIS, Albert GLENDENNING, Edgar ROGERS, Douglas ROGERS, Richard WILLIAMS, William MORLAND, Griffith JENKINS, Harry BULLOCK, Harry JONES, Frank MORROW, William ELLIS, William THOMAS, Fred SAVAGE, William John JONES, Percy BELLIS, Noel OWEN, James YOUNG, Albert WILLMORE, William ROBERTS, Chas. ATTWOOD, George ATTWOOD, John TOYER, (TOZER on memorial?) Clarence IZZARD, Sydney MASON, Samuel MARSDEN, Samuel AMOS, Thomas BITHELL, George PITT, Alfred BAKER, Clwyd HUMPHRIES, George JONES, George TEAGUE, Alfred PRESTIDGE, John JONES, William DAVIES, Albert MATHEWS, James PETERS, Harry AUTEN, John.M. REES, Roland POOLE, Samuel YATES, John J. HUMPHRIES, Walter PARRY, Abraham FRIETH (sic), William H. JOHNSON, Thomas G. ROBERTS, William CAMPDEN, Thomas CAMPDEN, Albert DARBEY, Edward G. JONES, Albert HIPKISS, Zacharia SEVERNS, William HART, John Edward DARBEY, Arthur GRIFFITHS, Richard J. JONES, George CANNON, David JACKSON, John ROBERTS, Enoch CADDICK, James LEATHERBARROW, Alexander MARTIN, Leonard LIFLEY(sic), Douglas FORRESTER, Harry BROUGHTON, Isaac MORRIS, John TURNER, Joseph BURROWS, Frank JONES, Willie LOWE, Percy NADIN, Alfred CASTREY, Thomas FISHER, Percy NICHOLS, Charles WILSON, Charles BATTEN, Eric LEATHERBARROW, William WALL, Thos. STREFFORD, Jabez PAGDEN, Edward HUGHES, Fred TOMPKINS, Edward YATES, Samuel COOPER, George LAW, Robert STEADMAN, Frank GARRATT, Frank OLDFIELD, William E.EVANS, Robert JOLLEY, Charles GREEN, John COTTERILL, Thomas HUGHES, Isiah BARNBROOK, John BARNBROOK, Joseph BARNBROOK, George COLLEY, Arthur J. EVANS, Albert ORGAN, William TOWNLEY, Charles WAINWRIGHT, Samuel WAINWRIGHT, George E. McCADDON. “The members of St. Ethelwold’s Church decided that their War Memorial should take the form of a side chapel. 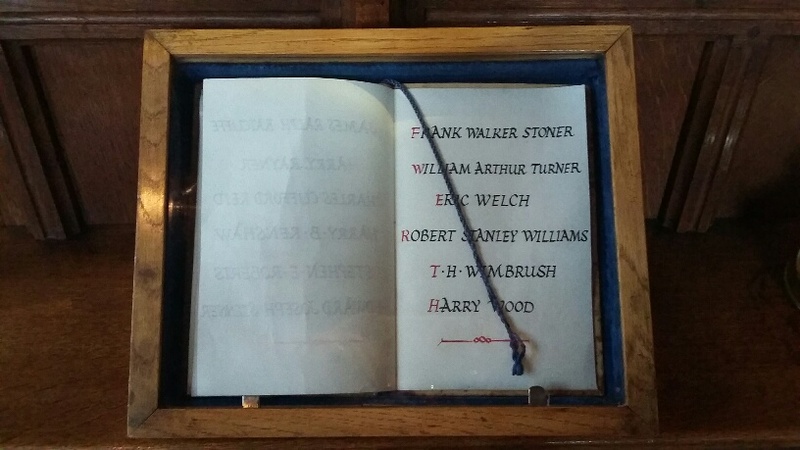 The work was carried out and the names of the fallen carved on an oak screen on the right hand side of the Lady Chapel forming the division of the choir stalls in the Chapel. The Lady Chapel was placed in the former organ chamber on the north side, and the base of an intended tower was built to be used as a vestry and organ chamber. The total cost was £3,200. 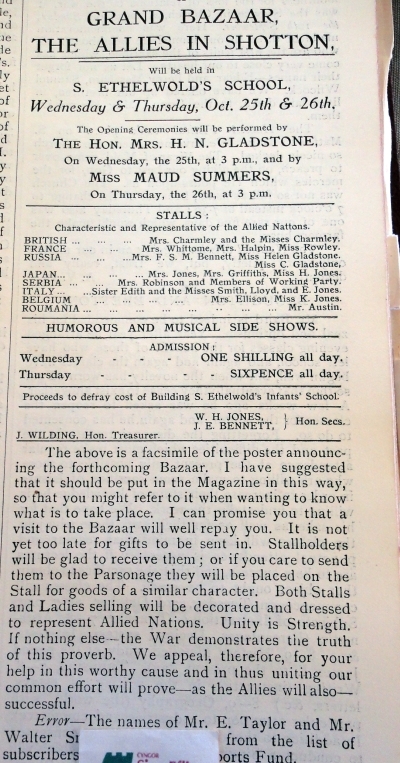 The Archbishop of Wales, A.C.EDWARDS, dedicated this extension to the church on Sunday 2nd October 1924. To the Glory of God who gave the Victory and in Memory of these Men who gave their lives in the Great War 1914 – 1918. AMOS, S., ATTWOOD, C., ATTWOOD, J., AUTON, H., BAKER.A., BARNBROOK, I., BARNBROOK, John, BARNBROOK, J. ,BATTEN, C. (Alias C.H. WILSON), BAXTER, F., BELLIS, P. , BENNETT, S. , BITHELL.T., BRASSINGTON, J., BROUGHTON, H., BULLOCK, H., BUNNELL, A., BURROWS, J., CADDICK, E., CANNON, G., CAMPDEN, T., CAMPDEN, W., CASTREY, A., COLLEY, G., COOPER, S., COTTERILL, G., DARBY, A.C., DARBY, J., DAVIES, W., DUTTON, B., ELLIS, W., EVANS, A.J., EVANS W.E., FISHER, T., FORRESTER, D., FRIETH, A., GARRETT, F., GLENDENNING, A., GREEN, C., GRIFFITHS, A., HART, W., HIPKISS, A., HUGHES, E., HUGHES, T., HUMPHRIES, C., HUMPHRIES, J.J., IZZARD, C., JACKSON, V., JENKINS, G., JOHNSON, W.H., JOLLEY, R., JONES, E.J., JONES, F., JONES, G., JONES, H., JONES, J., JONES, R.J., JONES, W.J., LAW, G., LEATHERBARROW, E., LEATHERBARROW, J., LEFFLEY, L., LEWIS, G., LOVATT, J., LOWE, W., MARLAND, W., MARROW, F., MARSTON, S., MARTIN, A., MASON, S., MATHEWS, A., McCADDON, G., MORGAN, M., MORRISS, I., MORRISS, R., NADIN, P., NICHOLLS, P., NORBURY, G., OLDFIELD, F., ORGAN, A., OWEN, N., PAGDIN, J.G., PAGE, N., PARRY, H., PARRY, W., PERRY, J., PETERS, J., POOLE, R., PRICE, S., PRIEST, G., PRESTYDGE, A., REES, J.M., ROBERTS, J., ROBERTS, T.J.M., ROBERTS, T.J., ROBERTS, W., ROGERS, D., ROGERS, E., SAVAGE, F., SEVERNS, Z., SPEED, R., STEADMAN, R., STREFFORD, T., TEAGUE, G., THOMAS, W., TOMPKINS, F., TOWNLEY, W., TOZER, J., TURNER, J., WAINWRIGHT, C.,WAINWRIGHT, S., WALKER, W., WALL, W., WELCH, S., WILLIAMS, C., WILLIAMS, R., WILMORE, A., YATES, E., YATES, S., YOUNG, J. 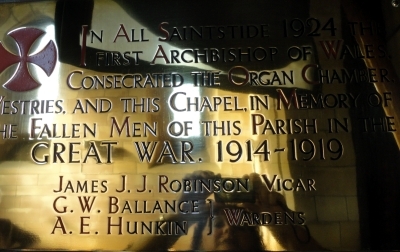 Brass Plaque on the wall nearby, apologies for my reflection on the beautiful brass. James J.J. ROBINSON, Vicar – G.W. BALLANCE, A. E. HUNKIN – Wardens.